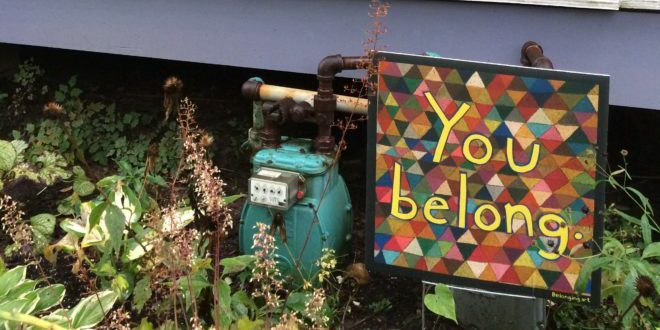 The “You Belong” sign in a yard in Pittsburgh. Last April, amid a string of rejections and the isolation of solo work in a studio, artist Bob Ziller reached for his oil pastels. Seeking solace, he created a colorful patchwork of triangles on tar paper. The drawing channeled the feeling he sought: connection. “I had physically just manifested that, so it was good timing,” said Ziller, who lives in Wilkinsburg, a town adjacent to Pittsburgh. He cut out the letters Y-O-U and B-E-L-O-N-G in yellow and blue origami paper, layered the words over his Sri Yantra-inspired design, and entered the contest. Ziller received $3,000, and the artwork was turned into a yard sign. The Sprout Fund distributed 1,250 of the signs for free across the Pittsburgh region. They also gave out 7,500 posters of Ziller’s design and 7,500 more posters featuring a mosaic of other Belonging project entries. Artist Bob Ziller, 57, of Wilkinsburg, Pennsylvania, created the winning piece for Belonging, a community art project created to show support for Pittsburgh’s immigrants and refugees. The Belonging project built on The Sprout Fund’s long history of supporting socially conscious public art in Pittsburgh. But the choice to create yard signs tapped into a trend that emerged during the 2016 primary election season. As politicians and news coverage made it feel like the country’s divisions were irreparable, some everyday Americans spread a more welcoming message through signs that read “No matter where you are from, we’re glad you’re our neighbor” in three languages. In addition to yard signs featuring Bob Ziller’s artwork, The Sprout Fund created a “community voices” poster with 18 of the pieces submitted to the Belonging project. Image courtesy of The Sprout Fund. More than a dozen community organizations joined with The Sprout Fund to host art-making events, promote the competition, and serve as distribution hubs for the yard signs and posters. Those partners included groups specifically serving immigrants and refugees as well as nonprofits with broader missions, such as the literacy council. The “You Belong” signs and posters can now be spotted in windows, parks and neighborhoods throughout the city. Ziller’s design was selected from about 250 submissions by artists of all ages. In the jurors’ reflections, they wrote that the artwork reminded them of a quilt, giving the feeling of many pieces coming together as a whole. Ziller said all the feedback he has received from the artwork has been positive, but his favorite comment was from someone who said that whenever they saw it, it felt like a warm hug. Ziller’s grandparents immigrated to the U.S. from France, Russia and Austria. The 57-year-old artist said he likes to imagine that new Pittsburghers who are learning English will look up the words “You Belong” after seeing the sign. He also hopes the Belonging project or similar initiatives will be adopted beyond Pittsburgh. Downloadable versions of the signs and posters are freely available on the project website. 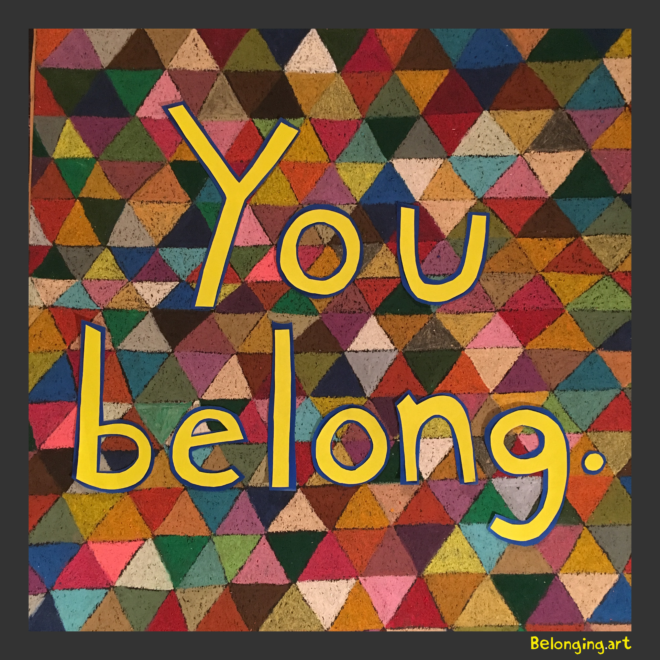 The site also includes a lesson plan for leading discussions and art-making on the theme of belonging.